Bahrns ToyotaLift offers JLG and Genie line of material lifts. These material lifts are used in supporting materials, unloading heavy materials that can not be removed solely by human power, placing heavy material on shelves or removing it. The material lifts offered at Bahrns ToyotaLift can easily and quickly lift as much as 1000 pounds from the ground to heights of twenty-six feet. Material lifts are a portable and efficient solution to your lifting needs and the cost conscious team at Bahrns ToyotaLift will help you select the material lifts that are most suited for you. Material lifts are powered by electricity and completely eliminate fuel costs. A more environmentally friendly option than gas powered lifting devices, material lifts are small, efficient and safe. Only one worker is required to operate one of the material lifts, so utilizing these material lifts will not tie up several employees. Bahrns ToyotaLift also offers full operating training so that safe operations of material lifts is a virtual guarantee. JLG and Genie both offer their own line of material lifts sold at Bahrns ToyotaLift of Central & Southern Illinois known as stock pickers. 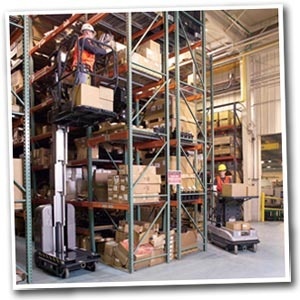 Stock picker material lifts were designed with efficiency, reach, and safety in mind. These material lifts were designed to perform stock picking, maintenance, and other tasks that can be repetitive and time wasting if done by hand. These material lifts are compact and convenient. There is an ease in the maneuvering of these material lifts so that they can be placed remarkably close to shelving and materials. This means these material lifts have basically eliminated the need for ladders or other elevating devices, increasing safety a hundred times over. JLG and Genie material lifts offer large platforms, 500 pound capacities, and can be raised up to 21 feet in the air. JLG and Genie are both dependable lines and well known names in the heavy equipment industry. Bahrns ToyotaLift is a licensed dealer of JLG and Genie material lifts and has the knowledge and experience to back up the products. Contact us for help with selecting the right material lift for you.